Batcave Toy Room - Better Living Through Toy Collecting: What if Mego Hadn't Passed on Star Wars? What if Mego Hadn't Passed on Star Wars? Imagine if Mego hadn't passed on a Star Wars toy line. What would the Star Wars line be like? Lucasfilm originally wanted Mego to produce the toy line for Star Wars, but passed on the offer. Can you believe that? After Mego's Planet of the Apes sales floundered after the cancellation of the TV series, Mego felt sci-fi wasn't the way to go. But passing on the line was probably what killed the toy company. So after Mego's polite no, Lucasfilm staff went right upstairs to Kenner and the rest was history. After Star Wars was a success Mego bought the licensing rights to almost every sci-fi related TV series or movie there was. Everything from The Black Hole, Buck Rogers, Star Trek, and Flash Gordon. These lines had moderate success, but no where near the success Kenner had with their Star Wars line. While concentrating on their others properties Mego neglected their world's Greatest Super Heroes line. Never producing a new 8 inch character ever again. Sales began to decline and one by one the Super Heroes numbers were reduced and Mego eventually went bankrupt. So what would have happened if Mego had said yes to Star Wars? The Mego Museum has put together a reimagined fantasy Mego catalog for 1978 to answer that question. 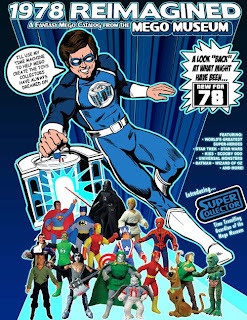 You'll be able to take a look at what the Star Wars line might have been like, what characters would have been released to The World's greatest Super Heroes line if there had been another wave, what if Mego had bought licensing for more profitable properties. I just picked up my copy. If you'd like to get a copy of your very own and fantasize what might have been, pick one up at the Mego Museum HERE. For more World's Greatest Super Heroes and Star Wars toys check us out.